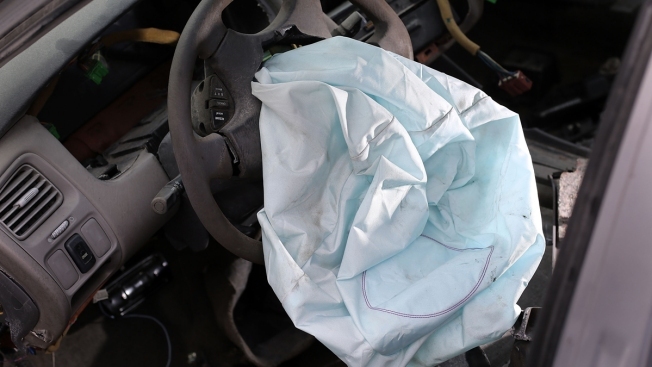 A deployed airbag is seen in a 2001 Honda Accord at the LKQ Pick Your Part salvage yard on May 22, 2015, in Medley, Florida. The largest automotive recall in history centers around the defective Takata Corp. air bags found in millions of vehicles. The U.S. government says automakers will end up recalling 42 million vehicles with potentially deadly air bag inflators made by Takata Corp. The National Highway Safety Administration released a schedule for further recalls on Friday as it tries to get automakers to move faster on the fixes. Eventually, about 69 million inflators that can potentially explode with too much force and spew shrapnel into people will be recalled. Some cars will have both the driver side and passenger side air bags replaced. As of last week, only 12.5 million, or about 18 percent, of the inflators had been replaced, and NHTSA said some automakers weren't doing enough to contact owners. The agency ordered the companies to submit a "recall engagement plan" within 90 days to increase the completion rate. Eleven people have been killed by Takata inflators in the U.S. and as many as 16 worldwide. The government says 180 people have been hurt in the U.S. alone. Recalls are being phased in through the end of 2020. NHTSA added McLaren to the list of affected automakers, bringing the total to 19. NHTSA officials said the recalls have been proceeding slowly in part because of a lack of availability of parts. Different cars need different air bag inflators, so it's not always easy to snap new parts into place. The agency says some consumers also haven't gotten repairs even though parts are available. The agency is urging anyone who gets a recall notice to contact a dealer and get their vehicle repaired as quickly as possible.